As some may know, I used the "Accepted for value" method to attempt to pay my most recent Electricity Bill. Today I received a letter saying it had not been paid. Thank you for your letter of the 18th February. I do not wish this bill to remain unpaid. However a few weeks ago I sent - what amounted to - a cheque in full payment drawn on my Live Birth Trust Account at HM Treasury. Can you please be so kind as to explain precisely why you have not been able to cash this cheque in payment of the outstanding bill? What I mean by this is: Have you actually tried to cash it? What was the result? Since this method of payment works in other circumstances, I would be interested to know why it does not work for Southern Electricity. Thank you in anticipation of an explanation. We'll see what happens. It's early days yet, on all this. Oh. Right. Now the kid gloves are off. I tried to pay by the "Accepted for value" method, including a polite covering letter. I received a repeated demand (see above), containing no reference whatsoever to my AFV attempt. So I responded politely, asking them what the problem was. Today I received a "Notice of Disconnection", containing no reference to anything, except threats. That's quite a disgusting way to behave, ignoring me like that, in my humble opinion. Now they have me upset. So it's time for Plan B. Which is the Plan that will run rings around them. It's the plan where you give them so much trouble, you make them wish they had never been born. Plan B is Veronica's Other Very Cunning Plan. 1) It works by setting up a Payment Facility, using the wrong Reference Number. Thus payments occur, but go into the Big Brother Company's Suspense Account. But you've paid. And your Bank Statement will prove that. So you are completely safe and secure at all times. 2) But they can't find the payment. So they send you the re-demand. So you write back and say I paid it on such and such a date. 3) So they threaten to disconnect you from their service. So you send them a letter pointing out that, as you have paid, they will be in breach of their Conditions of Service, and will need to pay hefty compensation if they carry out their threat. In the letter you INSIST that you have paid ... "My Bank Statement clearly shows a debit in your favour, am I am quite prepared to present this statement in a Court of Law"
4. They will demand to see your Bank Statement. The response is "What right do you have to the privacy of my bank Account? I'll be perfectly happy to present it as evidence in Court. That's all you need to know. Maybe my payment got filed in the wrong Account? Have you thought of that? How do I know? All I know is that I paid you, and you are lawfully responsible for continuing your service, and that it could turn out to be quite an embarrassment to you if you carried out your threat, without first checking the facts.". 5) They will find your payment in their Suspense Account, and send you a letter of apology. They will ask you to correct the Reference Number on your Payment Facility. 6) You can do one of three things. (a) Ignore their request, and continue this Plan accordingly (gets right up their nose), (b) you can write back saying "Listen: I paid you. And instead of politely discussing it with me, you sent me a menacing Notice of Disconnection. That was not, exactly, a very nice thing to do, was it? No, I'm not changing my Payment Facility. It works to pay you and to discharge my obligation so to do. Heaven help you if, due to stretched finances, I'm forced to pay in more than one amount. Politeness costs nothing, you know. Goodwill costs nothing either. What goodwill have you shown towards me? And I'll tell you something else. Henceforth you will be charged £100 for every letter I am forced to send you" or (c) Capitulate like a sheeple. So, I'll pay this one normally since, apparently, all polite discussion is now moot. But they will need to be on their toes henceforth. Politeness & goodwill costs nothing. I think they will wish they had tried a little harder. (PS: The problem with Electricity & Gas is that they CAN cut you off, as we all know. Consequently discussion about 'contracts' is a bit problematic, because they can say "Well, if there's no contract, we don't need to supply" Contracts are a sticky wicket in this case but - as I say - there is always Plan B.
I sent a covering letter with my original payment on the 23rd January 2009. 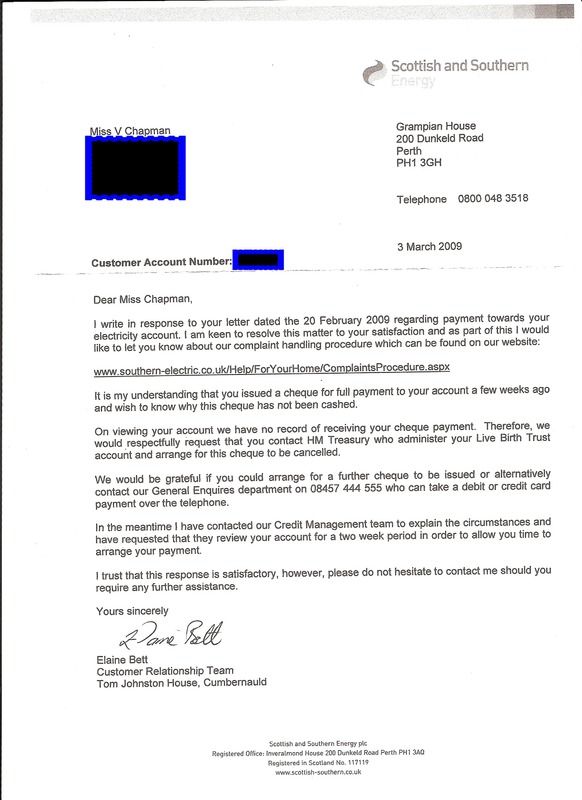 I sent a letter on the 20th February, 2009, in reply to your demand for payment. In the first letter I politely requested that you contact me if there were any problems. In the second letter I repeated this polite request, asking for details. You have not had the Common Law courtesy to respond in kind, but instead have sent me a demanding and rather arrogant NOTICE OF ELECTRICITY DISCONNECTION. Now, you are demanding payment in the amount £184.75. And I have, in repeated previous letters, expressed my desire to ensure payment. This desire has, apparently, been ignored, resulting in your NOTICE OF ELECTRICITY DISCONNECTION. There are two major problems with your stance. Permit me to explain them. 1) The first major problem you will find in the enclosed letter I recently received from HM Treasury. The appropriate phrases have been highlighted for your attention. You will note that it says 'money has no value'. That's not me saying it, Ms. Wickes. That's HM Treasury saying it. Consequently your demand for £184.75 has no value. You have made no demand for anything of value … according to HM Treasury. In consequence, since you have (you claim) not received anything of value, then your demand has been lawfully satisfied. In short, you have claimed nothing of value, and have received nothing of value. A perfectly lawful situation, and not entitling you to send out NOTICES OF ELECTRICITY DISCONNECTION, I think you will find. 2) On the other hand, if you consider that 'money has some value' (even though HM Treasury tells you this is not the case), then take notice that, henceforth, any correspondence I am forced to send to Southern Electricity will be charged at £100 (ONE HUNDRED POUNDS STERLING) PER LETTER OF CORRESPONDENCE, and the sum of £1,000 (ONE THOUSAND POUNDS STERLING) for THE SERVICE OF carrying out any Demand you may make in the future. (Hence this is a Notice). So what, precisely, are you demanding? Or, since HM Treasury have now shattered the illusion, do you wish to persist in a robotic belief in a 'numbers on a Computer Database' ILLUSION? In which case (under Common Law) I can place ILLUSIONS on the Database to exactly counteract yours (as you can see above), and actually turn them into illusory Credits - which you would need to 'pay' to me … under your self-same delusion? In short, Ms. Wickes, what do you want - reality or illusion? You and your Company can have either (but not both). I do not mind. In the first case I owe you nothing more. In the second case any Demand received will be charged at £1,000 for servicing. And an additional £100 per letter of correspondence into which I may need to subsequently enter. In neither case do you have the entitlement to disconnect your service to me without lawful excuse, and you have not proved (at this time) any such excuse. And any such proof of claim might become somewhat problematic whenever I entered the HM Treasury letter into evidence. I suggest it would have been better to have discussed this as I originally requested because - at some point in the none-to-distant future - you, and your Company (and your Lawyers, with whom you are recommended to check), will have no option but to come to terms with these matters, at the fundamental level I state herein, and fully in accordance with the words of HM Treasury. WITHOUT PREJUDICE i.e. all Natural Rights reserved. PS Another problem with your Demands is this. You are addressing them to a Legal Fiction called "MISS V CHAPMAN". Now Legal Fictions, being illusory, can hold illusory 'money' (it's the same 'world of illusion' of course). But Human Beings, such as My Human Self cannot own 'money'. Because Human Beings are not illusions, you see? We can hold banknotes of course, but HM Treasury has said they have no value. Now the problem is this: While, on the one hand, Legal Fictions, such as "MISS V CHAPMAN" CAN hold 'accounts' which contain illusions of 'money' (all in the Legal Fiction world), they have no soul, no mind, no arms, no legs, and no fingers with which to wield a pen and (for example) write a cheque. Only a Human Being is blessed with the capability of doing that. But a Human Being, being real, cannot have illusions attached. Unless said Human Being agrees (consents) to the illusion, entirely within the mind, with which that Being is blessed. I remain undaunted. I will send this. They need to know the score. Brilliant!!! Can't wait to see how this unfolds. I too have sent off a notice this week to a debt collectors who are looking to collect on behalf of a credit card debt. My signature, my money. My letter is as your template (slightly adjusted) and was sent yesterday. There is no way I am going to pay it so will take this to the very end anyway. Let's see what happens. Will be doing some A4V's as well this week. This is interesting... I'll be keeping myself updated for sure. I've requested another copy of my water bill, and will be sending that out A'd4V as soon as. I had a response back today, from the letter above. It implies that my letter was, actually, read. Thank you for your letter of the 3rd March. That was a strange salutation, wasn't it? Are you used to being called Elaine: of the Bett family, or Elaine: Bett, for short? I doubt it. What I was doing was addressing this communication to your Direct Self, as a Human Being. A 'sister' of mine. A sovereign Human Being, with a living soul, and eyes that can read this letter, and a Mind with the intelligence to understand it. If I had written "Dear Ms. Bett", or even "Dear Ms. Elaine Bett" I would have been attempting to communicate with a legal fiction. Known, in law, as a PERSON. Now, you may consider that you are a person and, in normal parlance, you most certainly are, however in 'legal' terms a 'person' is a fiction. It is designed to equate you to that of a small CORPORATION. Actually a SHIP. Do you mind being thought of as a SHIP? I, personally object to that, because I'm a Human Being, not a ship … what do you think? Well, I'm assuming you would rather be treated as an intelligent human, rather than as a lump of steel. So I took the liberty of addressing you that way. Now, why is all of this so important, you may be asking yourself? Permit me to explain. It is important in law. You see, the Statutes under which everything assumes it operates these days only apply to legal fiction PERSONS. These Statutes … that you consider to be 'the law', do not, necessarily, apply to Human Beings. Only Common Law applies to Human Beings. Yes, yes, I know you think that's wrong - but do check with your Lawyers, honey. If they tell you it is wrong, then sack them - because they don't know what they are talking about. Statutes only apply to the Society from which they originate. A Human Being can join a Society - and thus be bound by its rules - or not. In my case I'm not a Member of the Society of the Statutes. I'm not, therefore, bound by its rules. You think I am? Go ahead. Take me to Court. I'm not a Member of the Society that uses 'money'. But that doesn't mean I can't operate under some of its rules. What stops me doing that? Just because you think all the rules must be obeyed by you, doesn't mean I have to think the same thing, does it? I can choose to take the same actions as you do, in circumstances of my choice. It might look as though I'm obeying the rules, whereas in fact I'm simply acting of my own free will to do what is a sensible & responsible thing. No-one is saying all the rules are bad. Some are quite sensible if one acts responsibly towards others. And that's what Common Law is all about: Acting with responsibility towards others. That's it, in a nutshell. So now you know. 1)	I put you on Notice that, henceforth, you would be Invoiced £100 for each letter I sent back to you. However I'm prepared to waive that on condition that you read, consider, and fully digest, what I say herein. I think you will discover that it is all true, and that you need to know it. And the reason for that is because you will encounter it more and more in the none-too-distant future. 2)	I also put you on Notice that I would henceforth charge you £1,000 for the service of carrying out any demands you make on me. I can - actually - do that (and please don't think I can't, that would be a serious mistake), but it was primarily to ensure that you sat up and actually read my letter. The fact is that charging you £1,000 is as pointless as you charging me £184.75. If you read the letter I enclosed you will read HM Treasury saying 'money has no value'. 3)	I am in the process of setting up access to my Live Birth Trust. When I sent you the original Bank Giro "Accepted for value", I was under the assumption that it was set up. That's why I politely asked you to inform me if you encountered problems. It appears that there are still problems with this. I asked you for details, such as to enable me to iron out the wrinkles, and you responded with the NOTICE OF ELECTRICIY DISCONNECTION. Not very helpful in resolving the problem, was it? In the last few days I have initiated steps, with HM Treasury, to sort this situation out. I expect a reply shortly. 6)	However, I continue to repeat, 'money has no value', so none of this makes one iota of difference. You see, a Live Birth Trust Account (you've got one, by the way), has UNLIMITED FUNDS in it. Do you know what 'unlimited' means? It means 'there is no limit'. How can this be? BECAUSE IT'S ALL AN ILLUSION, Elaine. All an ILLUSION. Connect everyone to their Live Birth Trust Account, with its UNLIMITED FUNDS available … and "What is money?" What is money, Elaine, if you can write a cheque for any amount you like, and HM Treasury will cash it for you? Any everyone else can do the same thing? What is an Electricity Bill, in those circumstances? What is Income Tax? What is a Gas Bill? What, Elaine, is 'Southern Electricity' ITSELF? When all of its Customers can pay all of their bills, for evermore, by writing cheques on their Live Birth Trusts? Do you think sending demands might - just might - become somewhat pointless? Hold on tight, Elaine. Enjoy the ride! Because that's where we are going! The shades have fallen from the eyes of some of us. And the people waking up is getting to be serious numbers. The deceptions under which we have all lived (for centuries) are now being fully exposed. Time to send the perpetrators back underneath the rocks and stones from which they emerged. Mortgage? It was a fraud … they lent you your own 'money'! Loan? It was a fraud … they lent you your own 'money'! Credit Card? It's a fraud … they lend you your own 'money'! 'Credit Crunch'? It's a fraud. Gordon Brown? FRAUD. David Cameron? FRAUD. Politician? FRAUD. 'Bailout'? FRAUD. It's all a fraud. They lend you your own money. And then have the audacity to 'demand it back'! And we fall for this. But not for much longer, love. "Reason is the life of the law; nay, the common law itself is nothing else but reason. The law which is perfection of reason" Sir Edward Coke 1552-1634. What the hell would she reply to that?